Sunday - Gone To Church, You Should Too! Unless listed here we are only closed on major holidays. ﻿Everyone knows that printer manufacturers do not make money by selling their equipment but by selling their ink or toner cartridges. That is why many times they will give you their printer when you purchase a new computer or digital camera. Furthermore you seldom see any great deals on ink or toner cartridges from the big box office supply stores or even the Warehouse Clubs. The reason is because the printer companies keep a great deal of the profit and leaves the retailer with a very small profit margin. That is why ink products cost so much at national office retailers and Warehouse Club Stores, and if you haven't noticed has been going up in price year after year (see the chart below which gives you and idea on the decreased volume of ink you have been receiving these past few years). This is where Mr. Ink Plus comes in! 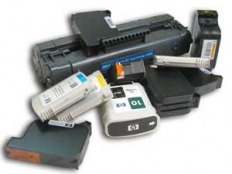 We specialize in: Laser toner, inkjet, laser and copier toner cartridges, thermal fax ribbons, dot matrix ribbons, and much more. If we do not have the cartridge you are looking for, most times we can get it for you. Just ask us!